The NFL's replacement referees stink. They are terrible, horrible, incompetent, of limited sight, limited mental capacity, biased and -- who knows -- perhaps even evil. Or at least that's the message playing out after every single snap – well, at least it feels like every single snap – when players and coaches react to the replacement referee's calls or non-calls like the official just shot their dog. There is outrage, screaming, pouting, physical intimidation, verbal assault and various forms of toddler-esque behavior. There was, Sunday night after the Baltimore Ravens' 31-30 victory over the New England Patriots, even an enraged Bill Belichick chasing down a ref and grabbing his arm in anger, the exclamation point of a game of incessant complaining from both sides. Beichick's act will almost certainly draw a fine, but it served as the culmination of a heated day of interaction in the NFL, an inevitable act due to the way the replacement referees have been handled and accepted by the league, its players and coaches. To NFL players and coaches: get over it and yourself. To NFL commissioner Roger Goodell: do something about it. For Goodell, the obvious solution is for the owners and the union to make a deal. The dispute appears to be mostly over pensions, seemingly a proportionally small issue in a $9 billion industry. In the interim though, Goodell needs to do more to protect the replacement refs he hired to call the games and stop what has become a distracting spectacle. It's been reported by multiple outlets that the league has sent a memo to teams warning them against bullying referees. But based on what we're seeing across the games, it hasn't taken. The coaches are still channeling their inner Bob Knight. And there is no word that a similar decree has been made to the players, who just never stop. On Sunday, broadcasters even pointed out how Philadelphia Eagles wide receiver DeSean Jackson's mid-play complaining affected him from making the actual catch that he claimed he was hampered from making. It was like a ref complaint vortex of futility. Then came Sunday night in an intense Patriots-Ravens game when countless players and both head coaches, Belichick and John Harbaugh, went hard after the refs. The end saw Belichick making physical contact with a ref – possibly angered by a close call on the Ravens' game-winning field goal, which sailed over the upright and wasn't reviewable. There is no way to say that regular referees would've made a different call on what is a nearly impossible to make decision. 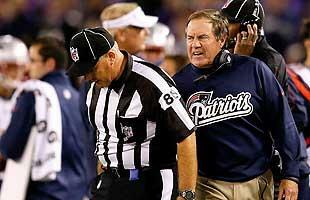 If the replacement refs are a blemish on professional football, then they are Goodell's blemish and he needs to own it. 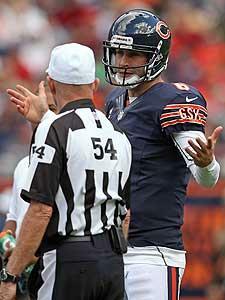 The league needs a much stronger and more public push for decorum when discussing calls during games. It needs to double down on fines for boorish, intimidating behavior. And it needs to be clear and honest publicly that it recognizes the growing pains and frustrations associated with replacement officials, while also making it clear that these are the league's chosen refs and the league expects them to be treated even better than the grizzled veterans they replaced. Players and coaches are careful, for the most part, from ripping the refs in the media because they know it will cost them. They'll be fined automatically. The no-nonsense policy works to keep them quiet. They share no such restraint during actual games where pouting, foot-stomping, throwing hands, eye-rolling and every other tactic of a 4-year old denied a cookie has become part of the post-whistle routine. Fans find a replacement ref botching a call annoying and insulting, but not as annoying and insulting as watching games turn into three-and-a-half hour temper tantrums. There has never been a perfectly officiated football game, and there certainly won't be one during this labor dispute. What once passed for good is different. The players and coaches need to accept the new normal and get on with the next play. If these were replacement players, would Bill Belichick employ the exact same complicated offense for whomever he signed off the Winnipeg Blue Bombers as he does with Tom Brady? And if he did, would he really be surprised when it didn't quite work as well? 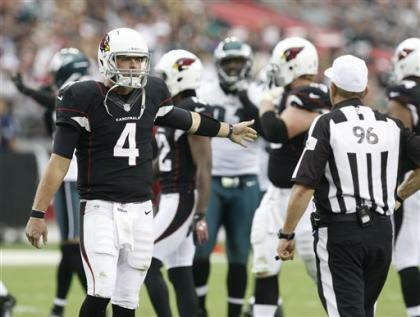 The intimidation of the replacement refs is so significant that Las Vegas sports books have begun factoring it into how they set the line based on expected clashes of personalities. Penalties on road teams are up, an early sign that the refs are trying to appease crowds and coaches. There's an obvious weakness here. And in the NFL, a weakness will be exploited. So coaches and players are doing it, and the result is poor sportsmanship and bad television. But it may work in getting the next call. The NBA tried to curb this a few years back when David Stern, among others, got sick of the players crying that they never committed a foul. It called for a mandatory technical for any complaining about a call. It was, at times, absurd, and over time things were relaxed. But at the very least, it got players thinking restraint in the heat of the moment. College basketball, in an effort to end the wild control freaks on the sideline, have attempted the same thing through the years. Very little of those histrionics even approach what's happening in the NFL. Yes, calls are blown. Calls were blown under regular refs also. The league has a sophisticated instant replay system to get the most important decisions of a contest – scoring plays and late game situations – correct. As for everything else, it helps no one to have an endless airing of the grievances after so many plays. It makes a bad situation worse.